Calculating and designing a Litz cable is a complex process. 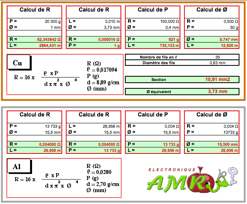 Calculation parametrers to define the cable composition, its aging, and the needed connections demand a very high expertise of calculation parameters. A bad definition of the cable composition may lead to drastic consequences on the whole system it is integrate in. It is also very upstream : at the time of design that we can influence on economical parameters and make sure that the solution is the best cost effective compromise. Our internally development unique software allows us to offer you control on thes aspects, while in the past they were mainly tackled in a "random experimental way". For the same voltage drop, Copper is 2.02 x heavier than Aluminium. Causes : an increasing demand from emergent countries (China, Brazil, India...) and the speculation ! The ability to work in high frequencies Strong Currents and Elevated Voltages requires to completely review the calculation and production tools to adapt new industrial products that reach the market. • Reduction in size of conventional magnetic circuits, implies a reduction of electrical circuits with a significant saving of raw materials (Cu or Al), but requires a higher value added processing. The Arrhenius law allows to establish a linear relationship between the logarithm of a measured value and the inverse of the temperature. The Arrhenius law is of considerable importance in the modeling of a polymer aging process. However, it must be used carefully considered in the context and often adapted to the environment in question. So in the above equation, the coefficient A should be given to statistical sampling of the population (example of the coefficient K data specific to an enamelled wire). Automatic calculation software for defining the agglomeration quality factor as a function of the nature of the wire, the diameter, the number of layers of the coil, the shape of the coil, the degree of the wire and the polymerization temperature. The program includes the calculation of the filling ratio, the edge effects and to define the crimping dies.